It’s Holly here today and I’ve got TWO fun valentines that are perfect for that special someone. For the first one, I’m using the Kiss Kiss stamp set and the banner from the Folded Gift Tag Die Set. I started by creating a watercolor background with some Picked Raspberry Distress Oxide. I set that panel aside to dry and stamped several of the hearts from the Kiss Kiss set using some pigment inks from Mama Elephant. I heat set the inks with my heat gun on low and then I added the sentiments in the hearts with some Sweet Gelato Ink from WPlus9. You get a better result with a dye ink over a pigment ink. You can see on two of my hearts the sentiment isn’t as crisp, these are the ones I used the pigment ink to stamp with. I cut each of the hearts out and adhered them down the front of the panel using alternating with foam adhesive to give some dimension. I die cut the banner from some White and stamped the sentiment from the Be Mine stamp set using the same Sweet Gelato Ink. I adhered the banner with some foam tape and added a few mixed pink sequins from Neat and Tangled. 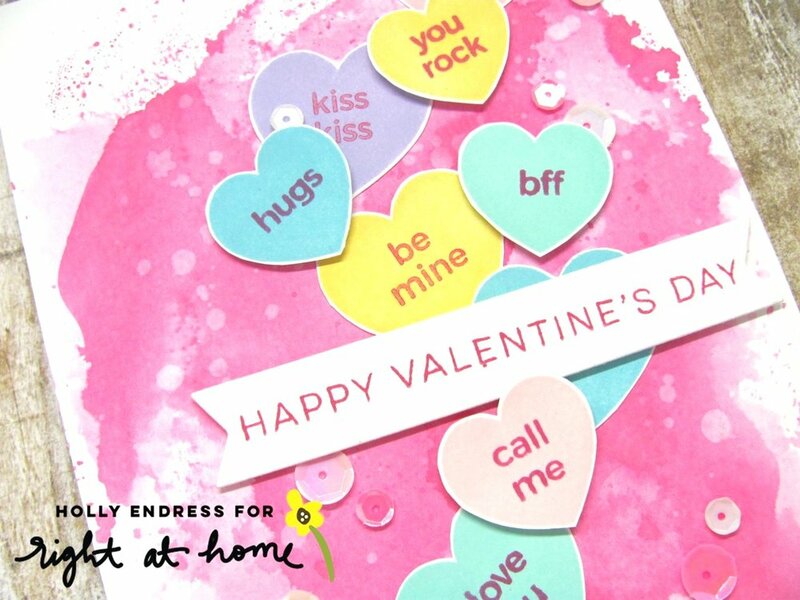 So cute and perfect for Valentine’s Day! I started the next one by heat-embossing the lips and heart images using some white embossing powder onto a piece of watercolor paper. Then I added some Candied Apple Distress Oxide ink and a few splatters of Black Soot Distress paint. I set that piece aside to dry naturally and then I die cut the heart from the Folded Sweetheart Die set. 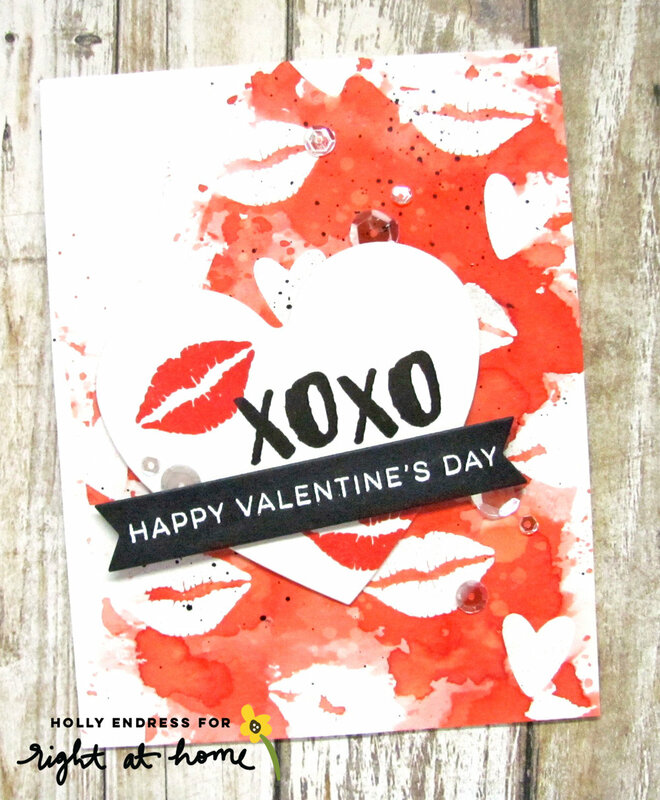 Then I stamped the XOXO in black ink and added some of the lips in the Candied Apple ink as well. If you haven’t tried stamping with your Distress Oxide inks give it a try, you get a great image every time. I adhered the heart to the background panel with some foam tape. 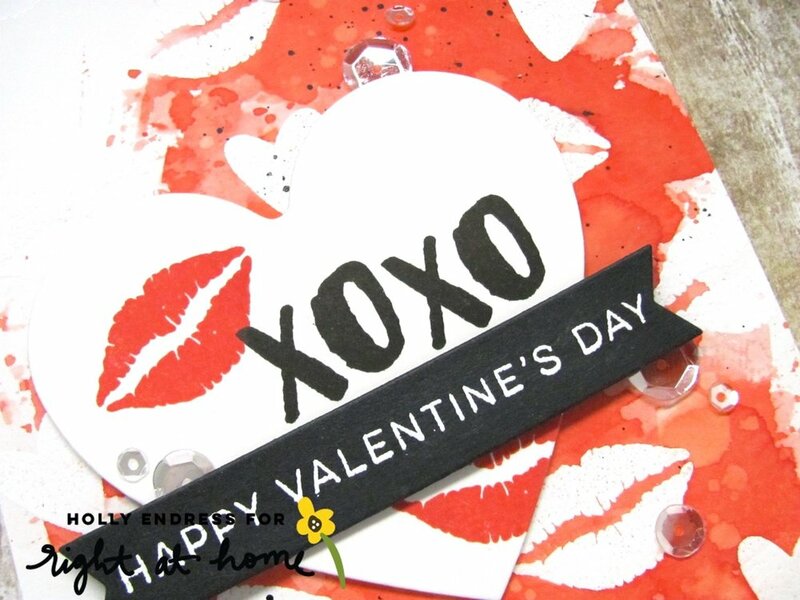 I die cut the banner from the Folded Tag Die set and heat embossed the "Happy Valentine’s Day" sentiment. Then I adhered the banner over the heart with some additional foam tape. I wanted to have a little pop of sparkle so I added some Sparkling Clear Sequins from Pretty Pink Posh. I wasn’t sure about this card at first but I really like that pop of black! Be sure to head over to the shop and see the latest release...it’s flying off the shelves! Hope you have a great Valentine's Day!